E.R. RAMACHANDRAN writes: The ongoing fast by Anna Hazare to usher in a Lok Pal has entered the 11th day. What is most striking with the manner in which Hazare’s fast has been dealt with by the current “rulers” in contrast to how the British handled Mahatma Gandhi’s numerous fasts. Since they were the rulers of an Empire where ‘the sun never set,’ the colonisers could have spirited Gandhiji out of India, thrown him into a jail in some far corner of the world, and made him totally irrelevant. Worse, they could have fed him slow poison and got rid of him and by the time the news reached India, it would have been some months, if not years, especially since there was no ‘breaking news’. In short, the British could have done anything to break the freedom movement. It is to their credit and to their sense of fair play that they did none of the above and allowed Gandhi his right to protest. Result: the freedom struggle took root and finally they had to quit India. Cut to 2011, Anna Hazare’s fast. Kapil Sibal, P. Chidambaram, Ambika Soni and Manmohan Singh attacked Hazare’s movement in their interactions with the press and in Parliament. The Congress party’s spokesman Manish Tiwari even declared that ‘Anna was corrupt from head to toe’ for which he tendered a meek apology later. After inviting civil society members, the government resorted to dirty tricks to damn their character on some pretext or other. They even had the temerity to arrest Hazare and send him to the same jail where Suresh Kalmadi, A. Raja and Kanimozhi were lodged, only to release him when the public reaction got too hot. Above all, we have seen a number of devious, duplicitous statements unbecoming of a government, which seems to have forgotten that it remains in power only at the pleasure of the people. Obviously, hindsight is 20/20 and the history books could well tell us a different story of how Gandhi was treated by the colonisers. Still, the question remains: were the British far more humane in their treatment of Gandhiji when an Empire was at stake than the Congress-led UPA has been of Hazare who is merely fasting for a tough piece of legislation? This entry was posted in Hindutva, Moditva, Issues and Ideas and tagged A. Raja, Anna Hazare, Churumuri, Fast Unto Death, Kanimozhi, Kapil Sibal, Mahatma Gandhi, Manish Tiwari, Manmohan Singh, P. Chidambaram, Sans Serif, Suresh Kalmadi. Bookmark the permalink. Who says for congress empire is not at stake? The queen and Prince in waiting have a lot to loose. How will they safeguard their Billion $ hides aborad? Should they become Italian commoners (horror of horror)? Gandhi was his own man. Hazare is not. Do not compare Gandhi with Anna.Gandhi was genuine Sytagrahi He never blackmail to British government. Whenever he thought he did wrong he accepted his mistake and ready to punished himself. On the contrary Anna is blackmailing government. accept my law as it is otherwise I will continue my fast. Gandhi never abused to anyone. .Anna continue abusing Manmohon Sing.Gandhi was gentleman Anna behaving just like Goona threatening to government do this do that surrender to me, bend to each every my whim. @Raghuvanshi Anna never abused anyone, he has spoken the truth. Problem is for Congress leaders, speaking the truth is like abuse. Anna has been very flexible, unlike the Govt. Initially he wanted the bill to be passed by 30th, but now all he wants is a resolution by parliament addressing three key issues. It is the senseless Govt. which is inflexible and continues to obfuscate. Hey what if the bill is put to vote in parliament and the congress votes to defeat it…that would be sweet…. The British could afford to be straightforward in their approach to the freedom movement as they did not have to worry about what the masses thought. To be fair to them they treated non-violent protesters differently from violent protesters. For the record they arrested Gandhi many times during the various movements he was involved in. As far as this 21 day fast in 1933 is concerned, it was supposed to be a fast for self purification in favor of Harijans. This was not necessarily against the British. On the other hand, the UPA government while being against Anna’s movement for obvious reasons, cannot afford to lose public support so adopts a duplicitous approach. Ack Thoo! What a lot of nonsense. Gandhi’s strictures were as much for his followers as for the State( British at that time). Mr Hazare’s focus is only on the easy target- the wily poiltician- a little bit or even a lot like our beleoved movie makers. Talking about fasts and rulers, the current ruling elite must be forever thankful for Anna Hazare and his IAC team. Had the mass movement goes berserk, one must realize that the entire Cong-I and UPA’s corrupt leaders would have swiftly fled abroad with their loot, family members and cronies, mind you: not just the Italian family. While people’s memory is short, we must recall the last days of Egypt’s deposed President Hosni Mubarak or that of Gadaffi and family or for that matter the various political clan’s across our own borders! The Anna Hazare movement has reflected the anger and outrage among the public due to monumental scams from Raja to Yeddyurappa to Mayawati across all parties. The tragedy of our times is such that we have absolutely insensitive politicians managing the country’s future! One saw a completely dumb MP like Rahul Gandhi saying the truly nationwide, peaceful movement is a threat to democracy and also suggesting a grand delaying tactic in the 11th hour to make Lokpal a constitutional body while others like Lalu Prasad and Sharad Yadav shockingly lampooning Team Anna with unbelievable sarcasm apart from trying to divert the matter by talking about reservations of Muslims, dalits not being involved in the movement…etc. Among the many good results of the people’s movement: it is now absolutely clear as how obsessively biased are so-called news anchors like Rajdeep Sardesai or Barkha Dutt. Some of these so called journalists and fixers literally and shamelessly talk and opinionate like they are the spokesmen of the Cong-I. Even now one can see Barka Dutt repeatedly trying her best to crush and pull down Kiran Bedi. 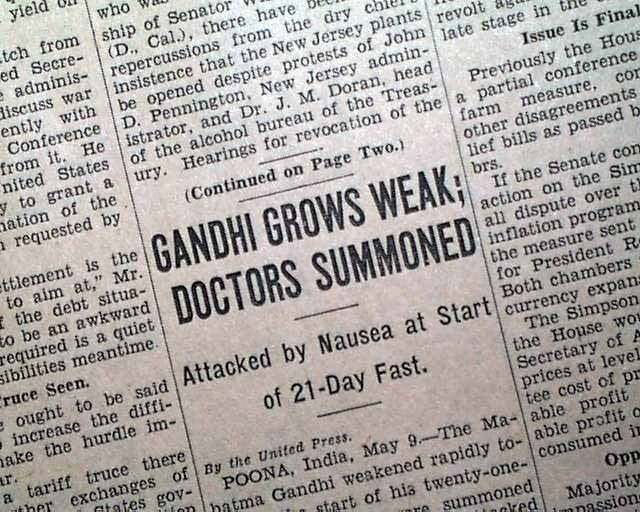 Gandhi’s methods of protest hardly bruised the British rule, it got them some bad press at the worst. They left India due to more pressing problems like shrinking coffers and remember, they had to import almost every thing they consumed in India. Anna Hazare and his IAC team – (minus) media = no revolution. is this a true revolution???? In countries like ours, corruption is one of the means of survival of the fittest. This is due to OVER POPULATION. You first bring some revolution to this issue, then talk about other things. Life in this country is cheap so is the case with minds of people.